Greetings! The following is a translation of a text published by the Orthodox Press of the All-Holy Tomb of Christ in Jerusalem in 1859 from the original Greek (http://voutsinasilias.blogspot.com/2010/02/blog-post_28.html). I believe these are sets of hymns, readings and prayers that can be used by pilgrims as they venerate the various chapels and sites within the Holy Sepulcher in Jerusalem. 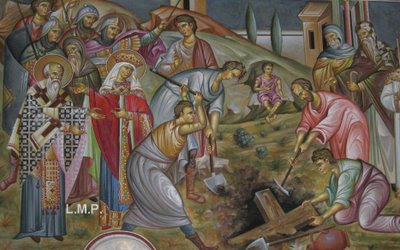 Hopefully it will be useful for pilgrims to the Holy Land, but as we all approach Christ's Divine Passion, we can also ponder the very great things that our Savior Jesus Christ endured for us all as He "worked our salvation". Note, many of the hymns and readings have been translated previously into English, and so I began with them citing where I found them. If you see a set of hymns below without a link following, note that they are most likely amateur translations from myself, and so it might be advisable to confirm those translations before use. In Jerusalem. From the Press of the All-holy Tomb [of Christ], 1859. The order of the holy litany. The most-pious pilgrims gather in the all-holy Church of the Resurrection, and embrace the Life-giving Tomb of our Lord...while the choirs standing before the holy Kouvouklion chant the following resurrectional troparia. Go around Sion, you peoples, and encompass her, and give glory in her to him who rose from the dead; for he is our God, who has redeemed us from our iniquities. As we the unworthy stand at your tomb which received life, we offer a hymn of glory to your ineffable compassion, Christ our God; because you accepted Cross and death, O sinless one, that you might give resurrection to the world, as you love mankind. The soldiers watching your grave became as dead men at the lightning flash of the Angel who appeared and proclaimed to the Women the Resurrection. We glorify you, the destroyer of corruption; we fall down before you, risen from the grave and alone our God. Rejoice you peoples and be glad: An Angel sat upon the grave stone; he gave us good tidings saying: Christ has risen from the dead and filled the universe with sweet fragrance. Rejoice you peoples and be glad! On the third day you rose from the tomb, O Christ, as it is written, and you raised our Forefather with you; therefore the human race both glorifies you and hymns your Resurrection. Christ has risen from the dead, loosing the bonds of death; earth proclaim the good tidings of great joy; heavens sing out the glory of God. Having seen the Resurrection of Christ, let us worship holy Lord Jesus, the only sinless one. We do not cease to worship Christ's Resurrection, for he has saved us from our iniquities, holy is Lord Jesus who showed forth the Resurrection. Hail holy Sion, Mother of the Churches, dwelling-place of God; for it was you who first received forgiveness of sins through the Resurrection. 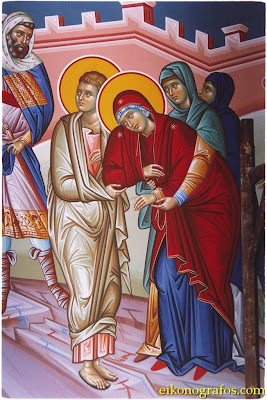 When you had truly risen from the tomb you ordered the holy women to proclaim the Resurrection to the Apostles, as it is written; and Peter, coming at full speed, stood by the grave and seeing the light in the tomb was struck with amazement. And so he both saw the grave clothes lying there alone, without the divine body, and he believed and cried out: Glory to you Christ God, because you save us all, our Saviour, for you are the brightness of the Father. II. The Chapel: "Do not touch Me"
With the Priest and Deacon going before with the priestly stole, we go to the Holy Pilgrimage named “Do not touch Me”, chanting the following Megalynarion. 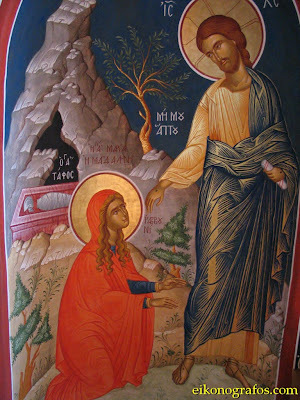 Mary Magdalene, approached the tomb, and seeing Christ as a gardener, questioned [Him]. Above are You enthroned with the Father, and below You are scourged on a pillar in the flesh, creation seeing this was struck with fear, glorifying Your divine condescension. O the depth of Your judgments, O Savior, having given Your back to be scourged O Good One, Adam and Eve as You delivered from scourging, in fear hymning Your compassion. Naked on the pillar, You Who filled the whole earth with flowers, You are scourged Who before, scourged the land of Egypt, O Savior. We glorify Your divine forbearance. He Who led the nation of the Hebrews before by a pillar of fire and a cloud, is bound upon the pillar, and is flogged upon the back. Glory O Christ to Your utter love for man. And the Priest censes, while the Deacon says the following litany of supplication. Have mercy on us O God according to Your great mercy, we pray You, hearken and have mercy. Again we pray for the pious and orthodox Christians. Again we pray for our brothers, Hierarchs, Priests, Hieromonks, Hierodeacons and Monks, and all of our brotherhood in Christ. Priest: Peace be unto you. 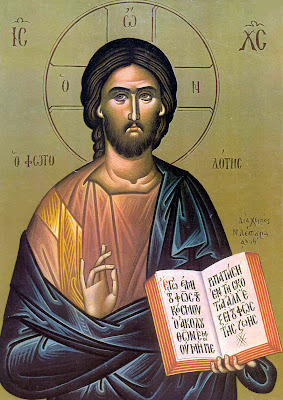 Lord Jesus Christ, only-begotten Son and Word of God, beyond all goodness, most-compassionate, glory to Your condescension that surpasses the mind, glory to Your utter compassion, glory to Your unspeakable love for man, glory to Your ineffable forbearance, for while we were the apostates, and you the sinless One, You were judged by Pilate, while we were the fallen, and You the righteous one were condemned, we were the scoffers, and You Who were not at fault accepted to be scourged on the pillar. O the unspeakable goodness, O the incomprehensible love for man, He Who sits upon the cherubim, is flogged on the back, He Who scourged Egypt with plagues, accepts scourging. But O Lord beyond all goodness, send Your compassions, You Who were wounded for us, heal the wounds of our souls, You Who suffered for us, free us from soul-corrupting passions, that we may in thanksgiving glorify You the dispassionate in Godhead unto the ages. Amen. Willingly long-suffering Jesus, You accepted the passion, that dispassion may be granted to mortals, my Son, to those who with faith venerate, and with fervor hymn Your compassion. Venomously gazing with dangerous wrath, the Hebrew nation hastens to deprive of life You Who are the life of the world, my forbearing Son, but I hymn your condescension with fervor. You willingly approached the passion my Son, to deliver from the passions Adam and those from Adam, and with the lawless You were numbered O merciful one, that You might save man from sin. The Pure One was struck wailing, Your Mother seeing You, Who willingly approached the passion O Redeemer, as an innocent lamb, through her intercessions deliver me from the passions. O Spotless, undefiled, incorrupt, most-pure, blameless, all-holy, bride of God, Theotokos, Ever-virgin Mariam [Mary], Lady of the world, our hope, look down upon us sinners at this hour, and may Jesus Christ Who was born from your pure blood without man, be merciful to us hearkening to your motherly intercessions, and you beholding Him condemned, and you whose heart was pierced with the sword of sorrow, pierce our souls with divine fervor, you who wept bitterly on behalf of His bonds and being made a spectable, grant to us tears of compunction, you who upon His imprisonment towards death was greatly embittered in soul, deliver us from the bitterness of our inglorious passions, that we may glorify you who are truly glorified unto the ages. Amen. Longinos, beholding the awesome and wondrous events of Your passion, came to know You as the Son of God in truth, and clearly confessed and proclaimed You. Hanging on the Cross, O Son of glory, the sun beholding You hid its light, and all were illumined with the light of divine knowledge, Longinos came to know You God and man. The skull of Longinos, which was cut off for You, the deceitful Hebrews formerly hid in the ding, but that blind woman, having found it could see and glorified You. O forbearing Savior Son of God, the divine Longinos, beholding You on the cross, was illumined O Merciful One, towards Your godly knowledge, and by his prayers may we be enlightened. Christ our God, the sweetest love of mankind, our light, our way, our life and our salvation, we thank Your unspeakable mercy, and Your inexpressible compassion and goodness, for by Your death by being nailed to the Cross, You wished to give life to us who were dead O Immortal One. And now most-compassionate Lord, receive the hymns of us Your unworthy servants entreating Your goodness, Who while upon the Cross was confessed by the righteous Longinos, we offer You this, saying: Truly, You are the Son of God. You, Lord, are the Son and Logos of God and God, You are the King of all. You are the King of kings, and Lord of lords. You are the Good Shepherd, Who sought out and found the lost sheep, and placed it upon Your shoulders, and brought it back again to Your beginningless Father. You, Lord, Who are glorified by all and in all, make us lowly and unworthy ones worthy to praise and glorify You always. You, the only pure and all-holy Lord, cleanse us from every filth of flesh and spirit. You, Who for the incorruptibility of men willingly drank the cup of death, water us with the wine of compunction, and grant to us remission of our offenses, through the intercessions of Your Ever-virgin Mother, of the Holy Great Martyr Longinos the Centurion, and all of Your Saints. Amen. The veil of the Temple, O Jesus, was divided in two, soldiers divided your garments, revealing to the whole world, that the Hebrews are divided as lawless ones. Strangely the soldiers, O Savior, Your seamless robe and that was woven above, did not split totally, but took it, O Compassionate One, that through this the Prophets of the Scriptures might be fulfilled. Those who before inherited, O Redeemer, the promise of this earth, the thankless and wretched ones divided Your garment, and cast lots for Your vesture. The lawless ones worked every surpassing evil, O Savior, behaving unseemly instead of desiring You, and dividing Your garments. Holy King, compassionate and greatly-merciful, Son and Word of the living God, our Lord Jesus Christ, glory to Your dispensation for us, glory to Your utter compassion. You, Lord, choosing to suffer for the world, were stripped naked by the soldiers, Who clothes the whole earth with flowers, and Your garments were divided there by the soldiers, Who before set aside the land of promise for the Hebrews. And those who had been the inheritors of Your great gifts and graces, cast lots for Your garment woven above, the ungrateful and thankless ones. 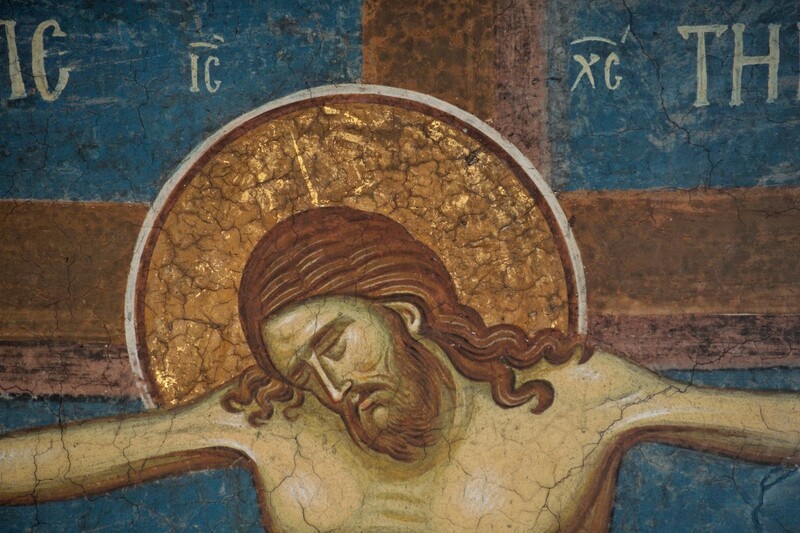 But You, O long-suffering Lord, Who for us was stripped naked and accepted to transfixed naked upon the Cross, cloth us with the garment of salvation, vest us with the garment woven above of Your divine grace, and show us worthy to be inheritors of Your kingdom, that we may praise You in gratitude, and glorify You in thanksgiving unto the ages. Amen. 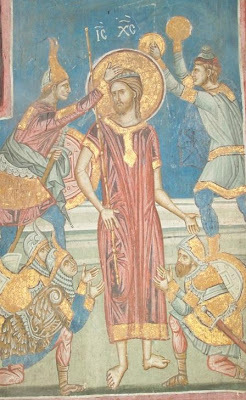 Receiving Rome from on high, Constantine before, the God-crowned King, asked his Mother with fervor, to hasten to seek out the Cross of the Lord. You, O life-giving Cross of Christ, which before the Hebrews in wrath hid in the earth, were found by the divine queen Helen, in this cave, and she embraced it with fervor. This cave, O Savior Christ, was shone to be blessed, for in it was received Your divine Cross, which before the lawless nation of Hebrews hid in it out of wrath. Your Cross was hid below the earth, as the sun, but shone clearly through the Rising, from this cave, which we the faithful standing by magnify. Our Lord Jesus Christ, the only-begotten Son and Word of Your pre-beginningless [προανάρχου] and co-eternal Father, Holy King, All-compassionate and Greatly-merciful One, at Whose name every knee bends in heaven, on earth and below the earth, and Who is confessed by every tongue, that Jesus Christ is Lord, to the glory of God the Father. You, O Lord, became like us, with the exception of sin, and through Your Precious Cross tore asunder the handwriting of our sins, look down upon us who are standing in this Holy and venerated cave, where Your Life-giving and precious Cross, which your crucifiers hid in wrath, was found by the divine queen Helen, who was seeking it with fervor, and which she venerated in fear, look down upon us and be gracious to us, O Lord. Guide our lives, make good our ways, direct our actions, and strengthen us against visible and invisible foes by Your precious Cross. And though the prince of this world, seeing You raised upon the Cross, was driven out, deliver us from his traps, and make us worthy of that joy, which the blessed Helen had when she found Your Precious and Life-giving Cross. Grant, O Lord, Your church harmony and unity, kings rule and peace, rulers unity-of-mind, and all Your people an untroubled and peaceful life. Those who take up the light weight of Your Cross, O Lord, make worthy to follow You in a good and pure life. And for those who follow You the Way and the Truth in obedience and to be crucified with You, deaden the pleasures of life. 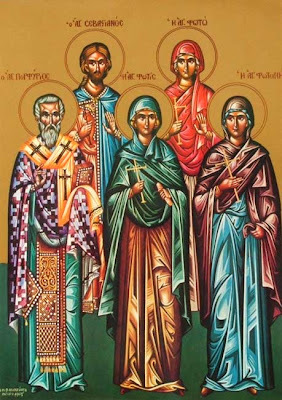 Through the intercessions of Your All-spotless Mother, by the power of Your Precious and Life-giving Cross, through the intercessions of the glorious and Godly-crowned great rulers Constantine and Helen, and all Your Saints. Amen. You wore the crimson robe in shame, O Jesus, which You were willingly arrayed in, O Savior, King of the Angels. We glorify Your utter condescension. The scarlet robe and the crown of thorns, my Savor, You were arrayed with, mocked as a king, O Word, by the lawless, You Who are the Most-high King of kings. The crimson robe You accepted, O Jesus, and endured spittings and blows, the reed as a scepter, slaps and wretchedness, willingly bearing shame, for man. O Your acceptance and forbearance, Son of God, for You suffered the terrible passion, My Savior, for those who hymn You; transform all our inglorious passions. Deacon: And that we may be deemed worthy to hear the Holy Gospel [let us entreat the Lord our God. Priest: Peace be unto all. The reading is from the Gospel of St. Matthew (27:27-32). Then the governor's soldiers took Jesus into the Praetorium and gathered the whole company of soldiers around him. They stripped him and put a scarlet robe on him, and then twisted together a crown of thorns and set it on his head. They put a staff in his right hand and knelt in front of him and mocked him. "Hail, king of the Jews!" they said. They spit on him, and took the staff and struck him on the head again and again. After they had mocked him, they took off the robe and put his own clothes on him. Then they led him away to crucify him. As they were going out, they met a man from Cyrene, named Simon, and they forced him to carry the cross. Glory to Your forbearance, O Lord, glory to You. Lover of man, lover of goodness, All-holy, Most-compassionate Lord Jesus Christ our God, our ransom and mercy, our salvation and re-creation, Who passively accepted the passion, Who are dispassionate in Godhead, deliver us from the influences of the enemy, and drive away from us the wrath of Your anger, You Who forbore for us the ridicule of wearing the scarlet robe, cloth us in the stole of incorruption, You Who accepted the crown of thorns upon Your all-holy head, the head of the body of the Church, crown us with Your compassions, and bless the crown of the year, You Who took the reed in Your right hand as a scepter, the King of all, raise us from the vanity of the world with the reed of Your grace, You Who endured spittings and slaps for us, show us worthy to endure every influence and the evil one. Through the intercessions of Your All-holy and Most-pure Mother, and all Your Saints. Amen. O Word beginningless from the Father, and light from before the ages, enlighten my mind, that I may fervently entreat you, and that I may be strengthened to hymn Your passion and Your Cross. Being defiled as I am by unknown darkness, O my Christ, I fall below Your feet, You Who make darkness Your hiding place. Having made Yourself known to us, we behold You, and we glorify Your passion. You were nailed to the tree naked, O my Redeemer, that You might array me in the garment of incorruption, of which I the wretched one was stripped of, for the former disobedience. You thirsted, O Savior of mankind, to bestow salvation, for on earth, You were not parted from the Father's bosom, and You voluntarily suffered the passion, to deliver all from the passions. You descended to earth, O Savor, that You might raise me up. You ascended the Cross, that I might be exalted. And You descended to hades, that You might deliver me. You wished to give life, O Merciful One, to him who was formerly put to death through the council of the evil one, along with all mortal nature. You were put to death on the Cross, and through this granted life. Being utterly dispassionate in Godhead, O my Christ, the Hebrews in wrath condemned You to death in the flesh, and crucified You senselessly in this place, O Savior. Son and Word of God, creation, beholding You stretched out upon the Cross, and suffering on behalf of Your servants, was struck with fear, and suffered with You, the Creator. That You might seek us out who are lost, O Merciful One, You emptied Yourself, taking the form of a servant willingly, and having found the lost sheep, placed it upon Your shoulders, offering it to Your Father. You Who created this world, and adorned it supernaturally, were unadorned therefore upon the Corss, not having any beauty that we might look upon. You were nailed, O Live-giver, that You might deliver the world. Your divine side was pierced by the lance by the Judeans, and ineffably poured forth from them blood and water, O my Savior: two streams of incorruption, for those who faithfully hymn You. The middle curtain of the Temple was rent, O Savior, as were the rocks, and the sun was darkened, and all the earth shook, as You were lifted upon the cross. You were seen dead upon the tree of Your own will, O my Redeemer, being immortal in nature, that You might grant immortal life to we who are dead. 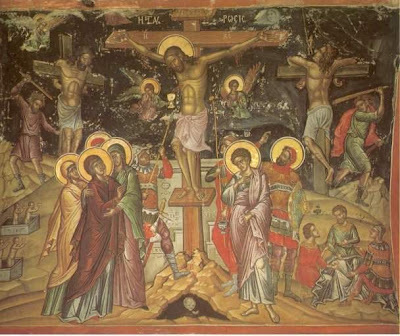 O my forbearing Jesus, You were nailed to the Cross, that we might be delivered from the bitter taste of that former tree. We glorify Your passion, and we honor Your Cross. They who once drank sweet water from the rock, offered You bitter drink, O forbearing Word of God. Glory to Your passion, O Savior, and to Your Holy Crucifixion. The children of those who had killed the prophets, in wrath placed You between two thieves, O Savior, condemning You as a criminal. We glorify Your passion, and Your utter compassion in fervor. Having not understood the Prophets, the Judeans nailed You to the tree, O Savior, lawlessly. We glorify Your passion, and we venerate Your Cross. You Who suspended the earth amidst the waters, O Word, were hung upon the tree by the murderers of the righteous ones, who offered You scorn, wagging their heads. Not being able to bear the sight of Your unjust crucifixion, the earth wished to swallow-up Your crucifiers. But at Your command, O Forbearing One, it was held back. All creation was struck with fear, seeing You outstretched upon the tree, dead and breathless, and suffering on behalf of Your servants, You Who are dispassionate according to Your nature. You tasted gall and vinegar, O Forbearing One, to water us with the sweet rivers of incorruption. Glory to Your passion, O Savior, and Your holy Crucifixion. Your life, O Savior, was willingly given up as a ransom, and You willed to die, Who are immortal in nature, deliver us from death by Your death, O Compassionate One. O inexpressible condescension! O utter love for man! You O Savior Who once fashioned man with Your own hand, how do you willingly suffer for him, and forbear and withstand? O greatly-compassionate Savior, we who honor Your passion, with Your righteous Thief number us, and save us, O Compassionate one, through the intercessions of the Theotokos, and all Your Saints. The Deacon: That we may we deemed worthy to hear the Holy Gospel, let us entreat the Lord our God. Gospel according to St. Matthew (27:33-55). The People: Glory to Your forbearance, O Lord, glory to You! O Master Lord Jesus Christ our God, the only forbearing one and lover of man, it is meet and right to hymn You truly, to bless You, to thank You, and to worship Your utter lover for man and goodness. For You inexpressibly took on our nature from the pure and virgin blood of You Ever-virgin Mother, thus taking on our shame, and You endured all things by Your awesome Passion upon this awesome and holy place of salvation, where You were crucified, and died willingly, in order to raise us who are dead in our sins. And now, O Christ our immortal king, send down upon us the riches of Your compassions, and look upon us according to Your great mercy. And cleanse us from every defilement of flesh and spirit. With the grateful thief, we cry to You the “Remember me” as he did, and make us worthy of Your heavenly kingdom. Remember, Lord, in Your kingdom, all the pious and Orthodox Christians, pilgrims, benefactors and supporters of the All-Holy pilgrimages, in which were Your spotless feet. And make them worthy with us, until our last breath, to partake uncondemned of Your blessings, through the intercessions of Your All-spotless Mother, through the power and grace of Your precious and life-giving Cross, through the intercessions of Your beloved Disciple John the Theologian, and all Your Saints. Amen. During the veneration by the people of the Holy Golgotha, we chant the following hymns slowly and melodiously. Come, peoples, let us worship the place on which stood Christ’s immaculate feet, and where his divine, life-giving palms were stretched out on a tree for the salvation of all mortals; and we circle the tomb of life let us raise the song, Let all creation bless the Lord, and highly exalt him to all the ages. 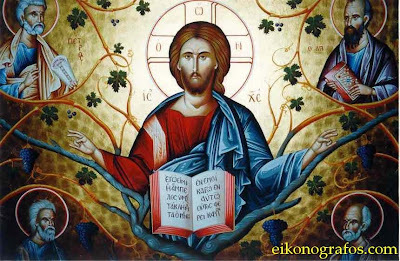 Today the words of the Prophet have been fulfilled: for see, we worship at the place on which your feet have stood, Lord; and tasting from the Tree of salvation, we have been delivered from our sinful passions at the prayers of the Mother of God, only lover of humankind. Come, O faithful, let us venerate the life-giving Cross, on which Christ, the King of Glory, willingly stretched out His hands, to raise us to the former blessedness, from which the enemy formerly stripped us through pleasure. Therefore, we were made worthy to crush the heads of our invisible enemies. Come, all people of the nations, let us honor the Cross of our Lord. Hail, O Cross, the utter redemption of fallen Adam, in you our most-pious rulers boast, that through your power we may conquer the Ishmaelite people. You, therefore, the Christians venerate, as we glorify the God Who suffered upon you, saying: O Lord Who suffered on the Cross for us, make us worthy of Your Kingdom. Proceeding to the Chapel of the Descent from the Cross, we chant the following hymns. Inexplicable is, to Angels and to mortals, the mystery, my Son, of Your unspeakable burial. You wished, O Fashioner, to save life. Thus, You willingly suffered, O Jesus, immortal life. Sharing the nature of all mortals, You put sin to death, and were ever shown the Giver-of-life, giving life through Your death. Come, all the earth, mourn with me bitterly, as the source of life, is beheld as dead. Joseph, Your formerly secret disciple, wisely revealed himself, that he might hide the light of the Sun. O Jesus, Giver-of-life, the sweetness of life, how were you hated, You Who are the illumination of men? The life of all life was exiled from life, while You granted life to every generation of mortals through Your death. O God-receiver Joseph, the pinnacle of the faithful, give us Jesus Christ, that we might venerate Him. Behold your disciple and friend, and Your Mother, O Jesus. Give us another word from Your mouth. Being the world of the world, You were seen dead and other-worldly, but You will fill the world with the godly joy of Your arising. A lance pierced Your side, O my sweetest Son, as You pour forth life, O Word of God and God. Being the true myrrh, pouring forth the fragrance of myrrh, I offer myrrh to You; annoint me, O Jesus. Now the noetic armies all gather in fear. How could I, the wretched one, dare to touch You? To lead the estranged Adam back to life, You were estranged, O Fashioner, my Son and God. O treasury of life, and killer of death, how are you now seen lying dead, O Redeemer? Where has gone the beauty of Your face, which surpasses all the words of the Scripture? You pour forth rivers, O Jesus, from Your divine side, cleansing mortals from the bitterness of sin. When You were on the Cross, the sun hid itself. How is the creator of the sun hidden in the grave as dead? You Who array Yourself with life as a garment, O Jesus, how can I wrap you in a burial cloth in the flesh? You Who poured forth water from Your side as fragrance, I will annoint with my myrrh and aloe. You Who I once beheld wrapped in swaddling clothes in the manger, I now see in grave clothes: O woe, what more fearsome clothes? You Who hold earth and heaven in the palm of Your hand, are now buried by Joseph and Nikodemos in the flesh. O my Son and Soul-saver, protect the multitude of those who faithfully hymn Your willing burial. O God-man Christ, protect us who praise Your willing burial, and who offer You hymns. At that time, Joseph of Arimathea asked Pilate for the body of Jesus. Now Joseph was a disciple of Jesus, but secretly because he feared the Jewish leaders. With Pilate’s permission, he came and took the body away. He was accompanied by Nicodemus, the man who earlier had visited Jesus at night. Nicodemus brought a mixture of myrrh and aloes, about seventy-five pounds. Taking Jesus’ body, the two of them wrapped it, with the spices, in strips of linen. This was in accordance with Jewish burial customs. At the place where Jesus was crucified, there was a garden, and in the garden a new tomb, in which no one had ever been laid. Because it was the Jewish day of Preparation and since the tomb was nearby, they laid Jesus there. The People: Glory to Your forbearance O Lord, glory to You. O God-man Lord Jesus Christ, the sweetest and saving name, Son and Word of the Father, pre-eternal and immortal, Who was impassible in Your Godhead, Who was obedient to Your Father Himself until death, even death on the Cross, Who alone was free among the dead. To You we offer our souls and bodies. In You we place our life and all our hope. You, O Lord, for us were put to death in the flesh, to put to death the passions of our souls. You, Who in this holy place were annointed by Joseph and Nikodemos, fill our souls with the fragrance of the grace of Your divine Spirit, and make us Your fragrance. You, Who were wrapped in a clean linen shroud, clothe our hearts with the linen of Your divine fear. And as You accepted the myrrh and aloe of Nikodemos, accept the hymns that we offer to You in Your kindness. Accept, O Lord, those who with fervor and faith have come to venerate these all-holy places, and divine pilgrimages, the pious and Orthodox Christians, and sail with these who sail, travel with those who travel, and keep them unharmed and out of danger day and night. And as You have made us worthy of Your earthly Jerusalem, make us worthy of the heavenly Jerusalem. And we who visit these holy churches and your beloved dwelling-places, make into churches and dwelling-places of Your All-Holy Spirit, through the intercessions of Your Spotless Mother, of the Holy and righteous Joseph and Nikodemos, of the Holy Myrrhbearing Women, and all Your Saints. Amen. Proceeding from there towards the All-Holy and Life-giving Tomb, processing around it three times, we chant the Troparia below. Adam the Forefather, who was once put to death through his disobedience, O Master, was granted life, O Immortal One. Through Your death, You put death to death, O All-powerful One. Therefore, O Savior, raise me who am dead. Glory, O Lord, to Your burial and to Your resurrection. Your judgments are an ineffable abyss, O Word, for You willingly submitted to death, to bring to life me who am dead, through the disobedience of the Forefather. And You Who became the New Adam, renew me who cries to You: glory, O Lord, to Your burial and to Your resurrection. Partaking of the race of mortals, You, O Greatly-compassionate One, brought salvation in truth. And You bore the signs of the passion, O Savior, willingly dying to grant life to those who sing: glory, O Lord, to Your burial and to Your resurrection. O Giver-of-life, Joseph and Nikodemos shed tears as they carried You, O Lord, upon their shoulders as one dead, to place the Immortal One in the tomb. You Who put hades to death, O Savior, put to death also my passions. Glory, O Lord, to Your burial and to Your resurrection. You were placed in a tomb, the noetic Sun from before the ages, Who ordered and fashioned all things, and You made this place light-bearing as the All-powerful One, which we venerate, as we cry to You: glory, O Lord, to Your burial and to Your resurrection. Cloud and storm, mist and darkness, the eyes of the Hebrews were terribly darkness, and not knowing what they were doing, they stretched out Life upon the cross, and consigned Him to the tomb, slandering Him as a deceiver. Glory, O Lord, to Your burial and to Your resurrection. You desired in Your compassion, O Christ, to be struck for us, O Compassionate One. And You, the life of all, accepted the Cross and death, and to be placed in a tomb, which was made light-bearing and which I call joyous. Glory, O Lord, to Your burial and to Your resurrection. You willingly suffered death, O Savior, and You descended to hades, O Master. 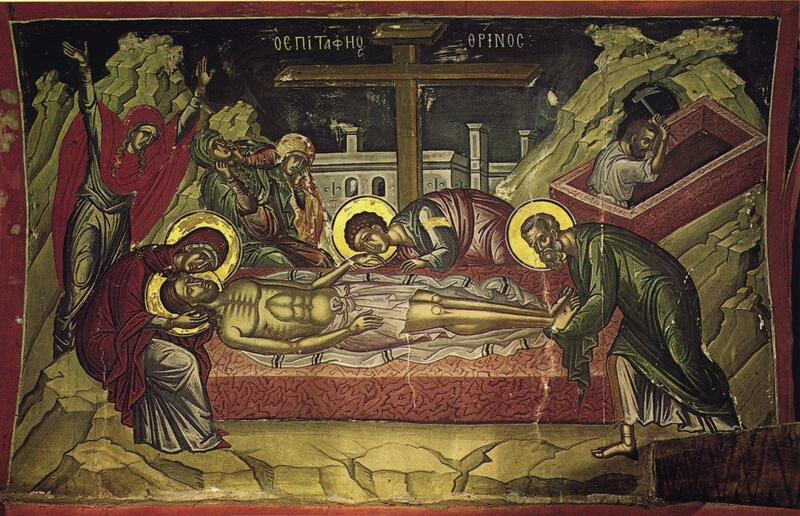 Your body was placed within a new tomb by Joseph and Nikodemos; bury my dangerous desires, that I might cry: glory, O Lord, to Your burial and to Your resurrection. Your blood that poured forth from Your side became healing to men, O Savior, and Life and resurrection to the dead through Your death, O Savior. Therefore we encircle Your tomb, and cry to You in faith: glory, O Lord, to Your burial and to Your resurrection. Joseph and Nikodemos placed You in a new tomb in fear, that You might recreate the corrupted nature of mortals, O Savior. Those who have been deified through You, sing to You out of need: glory, O Lord, to Your burial and to Your resurrection. A rock covers the Rock of life, and a tomb hides Him Who cannot be held. A seal was affixed to Your grave, protecting Him Who cannot be circumscribed. Soldiers guarded Your tomb, but we cry out with fervor: glory, O Lord, to Your burial and to Your resurrection. The Myrrhbearers came to annoint the Immortal One as dead. They heard a voice from the Angel, proclaiming His arising from the tomb. Their lamentation was transformed, and joyously they cried out: glory, O Lord, to Your burial and to Your resurrection. Hades was put to death through the death that You willingly endured, O Savior, piercing the ancient dragon that once deceived Eve. Adam dances together, being delivered from the vaults of hades. Glory, O Lord, to Your burial and to Your resurrection. The soldiers that guarded you beheld the strange form of the Archangel, appearing strangely in white garments like lightening, who rolled away the great stone from the tomb, and through the awesome earthquake, they became like dead men. Glory, O Lord, to Your burial and to Your resurrection. O Giver-of-life, You showed forth Your tomb as joyous and light-bestowing, for You, the life of all and the endless light, were placed within it, which we encircle, as we cry to You out of fervor: glory, O Lord, to Your burial and to Your resurrection. 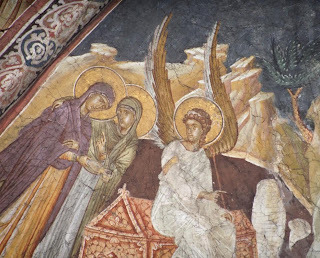 On the morning of the first of Sabbaths, the Myrrhbearers hastened with myrrh to anoint You, O inexhaustible Savior, but the Angel appeared to them, saying: the Lord is risen. Glory, O Lord, to Your burial and to Your resurrection. A rod of power and strength, grant to those who hymn You and your chosen ones, O Lord Who rose from the grave, and peace, that being saved in faith, we might cry our in thanksgiving: glory, O Lord, to Your burial and to Your resurrection. 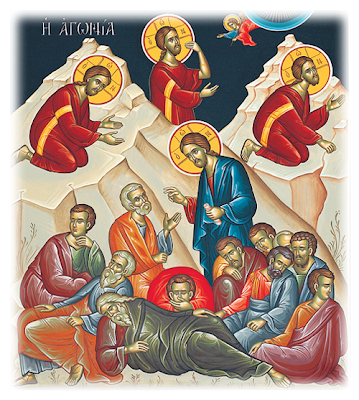 Your tomb, O Savior, the disciples saw open, and the grave clothes and the napkin laid in their own place, and they thus believed that You rose, and cried out to You with fervor: glory, O Lord, to Your burial and to Your resurrection. Having risen from the grace, O Savior, the disciples who saw You were filled with joy. You sent them out to the nations to preach Your resurrection, O Word, through whom we have been enlightened, and we chant to You in thanksgiving: glory, O Lord, to Your burial and to Your resurrection. We praise Your resurrection, O Savior, we venerate Your life-giving tomb, through which we have been granted the promise of Your kingdom, O Merciful One. We now surround it in fear and cry out in hymn: glory, O Lord, to Your burial and to Your resurrection. 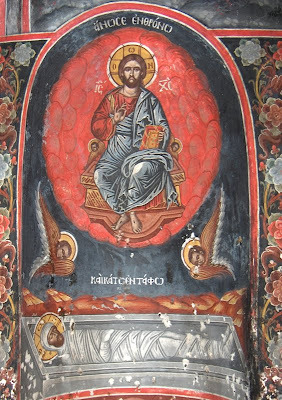 Your tomb, O Lord, was shown to be radiant as the sun, for it received You, the sun of glory, sleeping within it for three days, O Savior, and it wondrously shines upon those who faithfully chant: glory, O Lord, to Your burial and to Your resurrection. 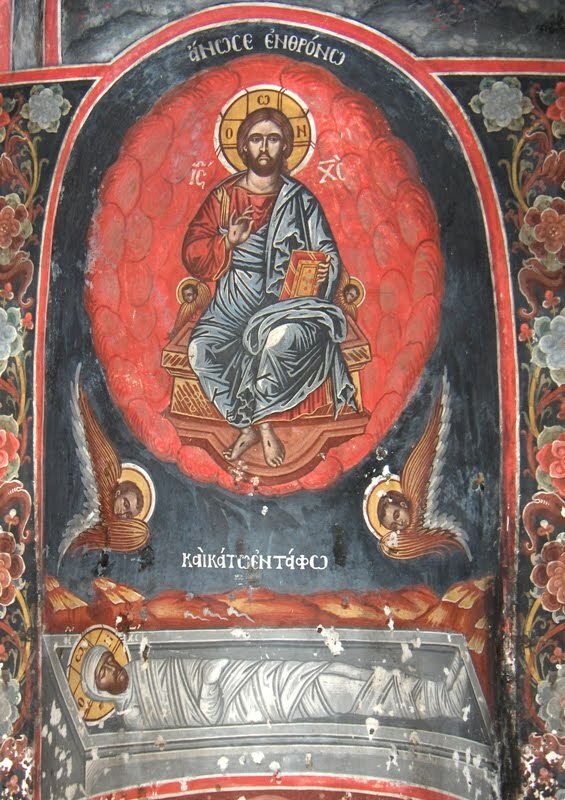 Your tomb pours forth a Godly-given eternal spring of goodness, O Christ, through Your life-bearing resurrection; come let us partake of it and cry out: O You Who rose from the grace, save us who cry out to You: glory, O Lord, to Your burial and to Your resurrection. Receive us who chant to You, O Merciful One, and glorify Your tomb, granting deliverance from bonds for all who approach Your life-giving tomb with faith, and who cry out with fear: glory, O Lord, to Your burial and to Your resurrection. O Greatly-Compassionate and Merciful One, through the grace of Your life-bearing tomb, grant healing of soul and body to those who venerate Your, and grant Your peace, through the intercessions of Your Mother, with whom we cry out with fervor: glory, O Lord, to Your burial and to Your resurrection. O Master Lord Jesus Christ Who loves mankind, the true light that illumines every man who comes into the world, Who for our salvation willingly suffered the passion, and in this all-holy Tomb was buried by Joseph and Nikodemos in the flesh as a dead man, put to death the soul-corrupting passions of our flesh, and bury through good thoughts evil schemes, Who through Your third-day and glorious resurrection raised the fallen race of Adam, raise us who were buried by sin, and set before us the ways of repentance, Who filled Your disciples with unspeakable joy through Your resurrection, fill our hearts with spiritual joy, and dissipate the sorrow of sin, Who granted to Your disciples and Apostles peace, grant it to us as well. You Who through Your resurrection filled heaven, and earth, and deeps with light, enlighten us with the light of Your face. You Who raised the dead from all ages, raise us also in the general resurrection in glory, and make us worthy to meet You in the clouds with Your Saints. You Who made this house of Yours a place of honor and glory through Your most-glorious Resurrection, and showed it to be a heaven of many lights, confirm it unto the ages of ages, and receive the prayers that we ceaselessly offer to You within it, through the intercessions of Your All-spotless Mother, the grace of Your All-Holy and life-giving Tomb, through the intercessions of the all-powerful Taxiarchs Michael and Gabriel, through the intercessions of Your Disciples and Apostles, of the Holy Myrrhbearers, and all Your Saints. Amen. Glory to You, O Christ our God, glory to You. 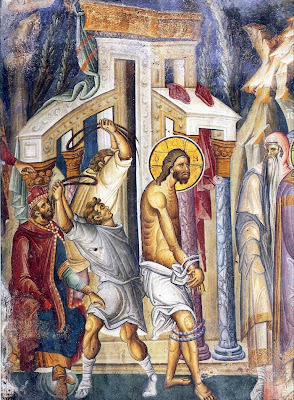 He Who suffered His willing and three-day burial in the flesh, and rose from the dead, Christ our true God, through the intercessions of Your All-spotless Mother, through the grace of Your all-holy and life-giving Tomb, and all Your Saints, have mercy on us and save us, as a good and merciful God Who loves mankind. "This was from me" is a famous letter written by saint Seraphim of Viritsa that he sent to his spiritual child, a bishop who was in a Soviet prison at that time; this homily "This was from me" is written as a consolation and counsel to the bishop to let him know that God the Creator addresses to the soul of man. "Have you ever thought that everything that concerns you, concerns Me, also? You are precious in my eyes and I love you; for this reason, it is a special joy for Me to train you. When temptations and the opponent [the Evil One] come upon you like a river, I want you to know that This was from Me. Know and remember always, no matter where you are, That whatsoever hurts will be dulled as soon as you learn In all things, to look at Me. Everything has been sent to you by Me, for the perfection of your soul. All these things were from Me." 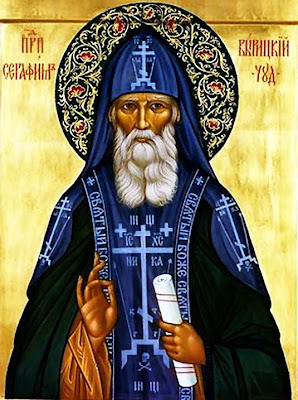 For excerpts from the life and counsels of St. Seraphim of Viritsa, see: http://quotes.orthodoxwiki.org/Seraphim_of_Viritsa and http://www.orthodoxinfo.com/general/stseraphimofviritsa.aspx. Because of this calendar change, some Athonite Monks -the self-titled "Zealots"- broke their spiritual communion with the Patriarchate and the rest of the Holy Mountain. They would participate neither in Liturgies, nor in festal celebrations, nor even communicate with the rest of the fathers. Katounakia was one of the centers of the Zealots and Papa Ephraim was one of them. 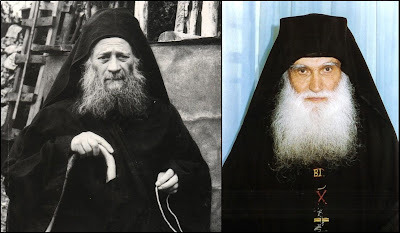 Moved by spiritual zeal, both he and Elder Joseph the Hesychast initially joined the extremist party of the so-called "Matthewites". When an issue arises concerning the faith, naturally fanaticism will rise up. Thus he made peace with himself. He waited patiently until 1975, i.e. for 23 years. He never gave anyone the right to criticise him. When he finally established his own brotherhood, he left the Zealots forever with great humility." “The Aga [Turkish leader] fell gravely ill, and he ran to doctors in every place, reaching even Thessaloniki, but none could make him well and his health deteriorated. He laid on his bed. 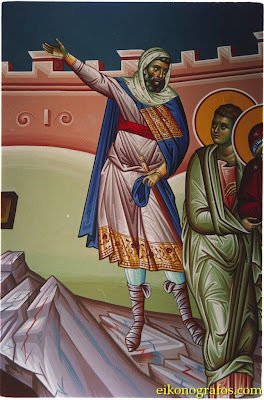 One day loosing all hope he thought of St. Photida, for the chapel of the Saint who was the sister of St. Photini [celebrated the same day, February 26th] which was about one kilometer from the village and in it up till today flows a spring of holy water. “The Holy Water of St. Photida”. “St. Photida will make me well”, the Aga said. He ordered the caretaker of the church of Amphipoleos to go bring him holy water from St. Photida. “The caretaker could not do otherwise. However, leaving the Aga's house he whispered: “Pig, do you think that I will bring you, holy water from our Saint for you to sell?” He left, counted the time that it would have taken to return from the chapel, and so that the Aga wouldn't drink it and to punish him, he took common water and gave it to him instead of the holy water. For more on St. Photini the Great Martyr and those with her, see: http://full-of-grace-and-truth.blogspot.com/2009/02/st-photini-great-martyr-and-those-with.html. "Prayer is the ascent of the mind towards God. It is a spiritual labour that befits the human mind more than any other preoccupation. Prayer is born from meekness and the lack of anger that brings to the soul joy and pleasure; it protects man from sorrow and depression. Just as bread is food for the body and virtue is food for the soul, so the food for the mind (nous) is spiritual prayer. Just as vision is superior to all the other senses, so is prayer more divine and sacred than all virtues. He who loves God, always converses with Him like son to father and is averse to every impassioned thought. Since prayer is an association of the mind with God, then in what state must the mind possibly be, in order to be able, without turning elsewhere, to approach its Lord and converse with Him without the mediation of something else? If Moses in his attempt to approach the burning bush was hindered until he had removed the sandals from his feet, then shouldn't you who desires to see God and converse with Him, remove and cast out of you every sinful thought? The entire war between us and the unclean demons does not occur for any other reason but for spiritual prayer, because prayer is extremely hostile and obtrusive to them, whereas for us it is a cause for our salvation, enjoyable and pleasant. What do demons seek to arouse inside us? Gluttony, prostitution, avarice, anger, resentfulness and all the other passions that fatten the mind so that it will be unable to pray properly; because when irrational passions prevail, they do not allow the mind to move logically. Do not think that you have acquired virtue if you have not previously struggled for it, even unto blood. Because, according to the apostle Paul (Eph 6:11) we must resist sin to the death, with a fighting spirit and an irreproachable manner. A bound person cannot run. Nor can the mind, which works like a slave for a certain passion, be able to offer a true prayer, because it is dragged around and wanders here and there on account of impassioned thoughts and cannot remain undisturbed. You will not be able to pray clearly if you are preoccupied with material things and are agitated by incessant cares, because prayer implies riddance of every care. If you wish to pray, you are in need of God, Who grants true prayer to whoever persists tirelessly in the struggle of prayer. Invoke Him therefore by saying: "Blessed be Thy Name, Thy Kingdom come" (Matt 6:9); in other words, may the Holy Spirit and Your only begotten Son come, because this is what Christ taught us, when telling us that we must adore and worship God the Father "with the power of the Spirit, Who reveals the Truth" (John 4:24). First of all, pray to acquire tears, in order to soften with mourning the savageness of your soul. You will then easily confess with honesty before the Lord all the sins that you have committed and you shall receive forgiveness from Him. Use your tears to succeed in every request of yours. For the Lord is greatly pleased when you pray with tears. If during your prayer you shed fountains of tears, do not pride yourself that you are above many others. This is not your accomplishment; it is assistance for your prayer from the Lord, so that you will be able to thus confess your sins willingly and appease Him. When you believe that you do not need tears in your prayer for your sins, consider how far you have drifted away from God, when "you should constantly be near Him" and then you will weep more fervently. Indeed, if you have an awareness of your condition, you will mourn gladly, deploring yourself and saying like the prophet Isaiah "How is it that while I am unclean and full of passions, I dare to appear before the Almighty Lord? (Isaiah 6:5). If you wish to pray in praiseworthy way, deny yourself at every moment; and if you suffer many hardships, reflect on the relief you will find when you take refuge in prayer. If you long to pray as you should, do not sorrow any person. Otherwise your prayer is futile. Whatever you do against your brother who has wronged you, will all become obstacles during your prayer. "Leave your offering" says Christ, "in front of the altar and go first and be reconciled with your brother and then come to pray without any agitation" (Matt 5:24), because resentfulness dulls the logic of man who prays and darkens his prayers. Those who pray but accumulate sorrows and grudges inside them are likened to people who draw water from the well and empty it into a leaking container. Do not be fond of chattering and human glory. Otherwise, the demons will conspire against you, not behind your back, but in front of your very eyes and they will rejoice with you during prayer time, as they will easily distract you and entice you with uncanny thoughts. If you wish to pray clearly, do not give in to any carnal demands and you will not have any cloud overshadowing you during prayer. Do not avoid poverty and sorrow, because they make prayer seem lighter. Be careful! Are you truly standing before God during the time of prayer, or are you perhaps conquered by human praise and you seek it, by saying many and lengthy prayers? Do not pray like the Pharisee but rather like the tax collector, so that you too may be vindicated by the Lord. The praiseworthiness of prayer does not lie in its quantity but its quality. This becomes apparent in the parable of the Tax Collector and the Pharisee and the words of Christ: "When you pray, do not ramble like the idolaters; for they think that with their chatter they will be hearkened" (Matt 6:7). Do not pray only with external gestures; instead exhort your mind to be aware of the task of prayer with immense fear. Whether praying alone or together with your brothers, struggle to pray, not out of habit but with awareness. Awareness of prayer means the gathering of the mind (Nous) with piety, with devout concentration, with secret sighs and the soul's pain that accompanies the confession of our sins. You should remain standing and endure the exertion, praying with intensity and perseverance and scorn the cares and the thoughts that come to you. For they agitate and upset you, in order to paralyze your strength and intensity. Strive to keep your mind deaf and mute during the hour of prayer. Only thus will you be able to pray. Chanting quells the passions and pacifies the disorderly movements of your body. Therefore chant with awareness and seemliness and you will thus resemble an eaglet soaring high. If you have not yet received the gift of prayer or chanting, ask for it persistently and you shall receive it. The devil greatly envies the person who prays, and he uses every possible trick with the intent to hinder his purpose. Thus, when demons see that you are willing to pray sincerely, they will intentionally remind you of certain supposedly necessary things. Soon after, however, they make you forget them, then they force you to look for them. And because you do not remember them, you become worried and sad. When you resume your prayer, they again remind you of the things you were looking for, so that your mind turns back to those things again, and eventually lose that fruitful prayer. During prayer, your memory will bring you either fantasies of past things or recent cares or the face of the one who had grieved you. Therefore, guard your memory well, so that it does not present you with its own cares. And continuously urge yourself to remain aware in Whose presence it is standing, because it is very natural for the mind to be easily carried away by memory during the time of prayer. The attention paid by the mind that seeks prayer will find prayer, because prayer follows attention more than anything else. Let us therefore ensure that we willingly strive to acquire attention. At times, by remaining standing during prayer, you can immediately concentrate and pray well; at other times, you may strive very hard, but not achieve your purpose. This occurs, so that you may ask for prayer with greater zeal; and after acquiring it, to have it as your inalienable achievement. Know that the holy angels prompt us to pray and stand alongside us and rejoice and pray for us. If we therefore become negligent and accept the thoughts that the demons subject us to, we greatly dismay the angels, because, while they strive so much for our sake, we do not want to beseech God - not even for our own sake; instead, by ignoring their services and abandoning their Lord and God, we converse with unclean demons. A true prayer is said by the one who always offers his first thought as a sacrifice to God. Do not pray for your desires to be realized, because they certainly do not agree with the will of God; but rather, as you were taught, say in your prayer: "Let Your Will be done" (Matt 6:10), and for every single thing, you should likewise ask God that His Will be done, because He wants whatever is best and beneficial for your soul. I have often asked God through prayer for something I thought to be good. And I insisted illogically on asking for it, thus violating the divine will. I would not let God provide whatever He knew would be to my benefit. And so, having received what I had asked for, I afterwards felt very sorry that I had not asked that His Will be done, because things did not turn out as I had thought they would. What is benevolent, if not God? Let us therefore entrust all our needs with Him and everything will go well, as the benevolent One definitely also bestows beneficial gifts. In your prayer, ask only for the justice and the Kingdom of God - in other words, virtue and divine knowledge - and all the rest will then be added to you. Entrust the needs of your body to God, and that will reveal to Him that you also entrust the needs of your spirit. Strive in your prayer to never seek any evil to befall anyone, so that you do not destroy whatever you have built by making your prayer abhorrent. Let the debtor of the ten thousand talents in the Gospel be an example to you. If you do not forgive the person who has harmed you, neither will you attain the absolution of your sins; because the Gospel says of the debtor of the ten thousand talents who did not forgive his debtor, that "he was delivered to his torturers" (Matt 18:24-35). It is appropriate that you do not pray only for yourself, but also for every fellow-man, so that in this way, you will be emulating the angelic manner of praying. Do not be sorrowed if you do not immediately receive from God that which you asked for, because He desires to benefit you even more, through your patient perseverance in prayer. What is there indeed more superior to associating with God and conversing with Him? In wishing to teach His disciples that they must always pray and not be discouraged, the Lord narrated an appropriate parable (Luke 18:1-8). In this parable a certain unfair judge said the following about a widow who was persistently demanding to be vindicated: "Even if I neither fear God nor feel any shame before people, however, because this woman continuously bothers me and demands to be vindicated, I shall do so". And the Lord then concluded: "So also shall God soon fulfill the wish of those who beseech Him day and night". That is therefore why you should not be discouraged or worried because you did not receive it, because you will receive it later. Be happy and persist, enduring the toil of holy prayer. Overlook the needs of the body when you pray, so that you do not lose the greater gain of your prayer from the sting of a mosquito or the buzzing of a fly. If you have diligence in prayer, be prepared for attacks by demons and endure their blows with bravery, because they shall charge at you like wild beasts, to torment you. He who suffers sorrowful things, will also attain joyful ones. He who perseveres during unpleasant things, will also enjoy pleasant ones. Do not imagine any form for God when you pray, or allow any shape to imprint itself in your mind; only approach in an incorporeal manner the incorporeal God. Do not desire to see with your bodily eyes the angels or powers or Christ, in case you might lose your mind completely and thus accept a wolf instead of a shepherd and worship the demon enemies. Guard yourself from the traps of the demons. For it happens that as you pray in peace and quiet, they may suddenly present you with a strange form, in order to lead you to pride, as you might suppose that it where the divine is. But the divine is incorporeal and without form. Take care to have plenty of humility and bravery, and no demonic influence will touch your soul. The angels will invisibly drive away the entire influence of the demons. When the cunning demon uses numerous means and cannot hinder the prayer of the righteous, he withdraws for a while. But then he revenges him later, by pushing him to anger, in order to disperse the exceptional inner state that was created through prayer, or by arousing him with carnal desires in order to pollute his soul. When you pray the way you should, expect temptations. Stand therefore courageously, to preserve the fruit of your prayer. Because from the very beginning that is what you committed yourself to - working the prayer and guarding its fruits. (Gen 2:15). Having worked therefore, do not leave unguarded what you earned, otherwise you will not have benefited at all from your prayer. If you pray in a God pleasing way, you will meet such trials, that you will think it is only fair that you become angry. However, no anger against your neighbour is justified. If you study the situation carefully, you will find that it is also possible to resolve the case without anger. Resort therefore to every means, so that you do not become angered. By co-suffering with our ailment, the Holy Spirit comes to us even though we are unclean because of passions and sins. And if He finds the mind praying sincerely only to Him, He will prevail over him, scatter all the legions of evil thoughts and reflections that surround him and exhorts him towards the love of spiritual prayer. Do you have a passion for praying? Make yourself dead to this earth. Always have Heaven as your homeland - not with words, but with an angelic life and divine knowledge. Forsake all things, so that you may inherit everything. If you are a true theologian, you will pray truly. And if you pray truly, you are a true theologian. Blessed is the mind that during prayer does not form any shape whatsoever inside it. Blessed is the mind that prays without being distracted and continuously acquires an increased desire for God. Blessed is the mind which during the time of prayer becomes incorporeal and free from everything. Blessed is the mind which during the time of prayer remains uninfluenced by anything. If during prayer you feel greater joy than any other joy, then you have indeed found the true prayer."